The TMNT are watching the tube when Master Splinter walks in and asks them when the last time was that they had run their patrols… Leo motivates the mutants to go on patrol and then to pick up some groceries. Splinter sits down to watch the news, and sees April reporting about a spy, known as the Chameleon, who has stolen some classified weapons plans. We then cut to the double-agent as he is fleeing from the police. To make his escape, the spy heads down into the sewers, and as Fate would have it, he arrives at a crossroads (crosspipes?) where he runs into both the TMNT and Bebop and Rocksteady! Rocky nabs Chameleon, and as the Turtles prepare to bonk heads, a Foot soldier shows up on a weird vehicle equipped with giant fists. The contraption proves to be enough of a distraction to allow Bebop and Rocksteady to escape with the Chameleon. Meanwhile, Donny is working on the weird new Foot vehicle when Bebop and Rocksteady come at the Turtle lads with guns blazing. 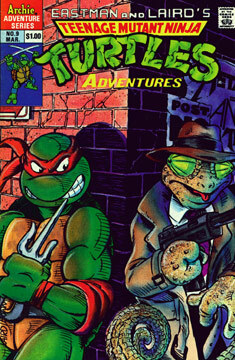 The TMNT head for cover and a close-quarter shoot out takes place… Raph using his throwing stars and Shredder’s henchmen firing their laser rifles. As it turns out, Chameleon arrives back on the scene, because the crossroads is where the plans are hidden! He draws fire from Rocksteady and Bebop as he’s perched upon the ceiling, and the lasers’ blasts bring the roof caving in on the hapless henchmen (who were saved from death by hiding under the Foot vehicle). Before the debris hits the floor, Chameleon retrieves the plans from their hiding place and makes another escape! With the tunnel sealed off, the TMNT head for home, thinking that Rocksteady and Bebop were killed in the collapse. As the issue ends, we see the mutated Chameleon watching the report from outside a department store window, grinning.